According to a new study by Pew Research Center, social media users are angrier than they’ve ever been — at least as best as we can tell using emoji. Since the inauguration of one Donald J. Trump, social media users are mashing the angry reaction more than ever. While “Like” remains the most common reaction, and “love” has been the most-used non-default reaction since it was released in late 2015, “angry” has since taken the crown, and by a wide margin. Facebook first unveiled the new emoji reactions globally in early 2016, although many users had then in late 2015. These reactions include emoji to express: anger, love, sadness, shock, and the traditional thumbs up. Interestingly, since the launch coincided with Trump‘s campaign, there are a number of data points Pew was able to explore. You can check out the entire study here. For us, the most interesting part of the survey was in the use of the anger emoji, which has increased exponentially. After its release, the angry face was a relative dud. Both democrats (1 percent) and republicans (2 percent) used it, but not very often. From inception to around the time of the election, use slowly increased, but never really managed to spike — the same as most other non-default reactions. That all changed in November of 2016. 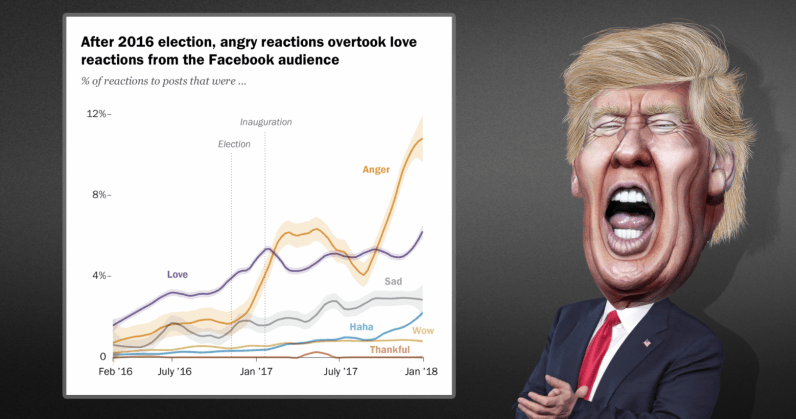 For the first time in its history, the angry emoji showed a massive spike, doubling from 2 to 3 percent usage to around 6 percent, where it peaked shortly after Trump‘s inauguration. It steadied there, remaining relatively stable for a few months before dropping, although never to its prior norm. Somewhere around September of 2017, though, it spiked again — and much higher than the previous one to just under 12 percent. Now, it’s stabilizing again — or, at least it was in January when Pew concluded its study — with republicans being slightly more angry than democrats, using the reaction 6 percent of the time, compared to democrats‘ 5. Admittedly, use of an emoji reaction might not be the best or most scientific approach to determining anger levels of social media users. But anecdotally, I think few of us would find fault in the results that social media users are raging against the machine just a tad more than in days past, regardless of political affiliation.